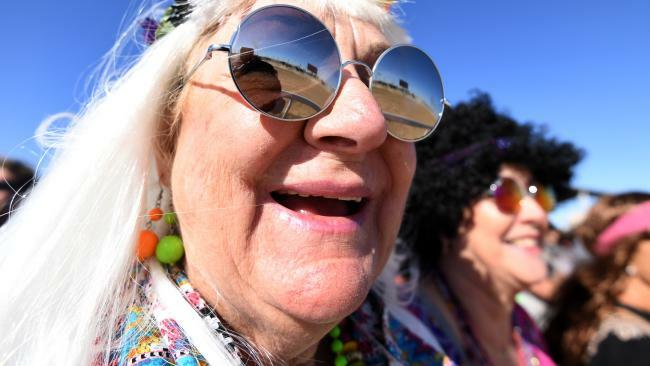 Racegoers in hippie costumes watch the Birdsville races. Picture: AAP Image/Dan Peled. IF YOU head to Birdsville races expecting the glitz and glam of Melbourne's Spring racing carnival, you may want to re-pack your suitcase. Sure it's dubbed the 'Cup of the Outback', and yes it does have a Fashions on the Field event and a VIP marquee - but this race meet is about as far from civilised as they come. 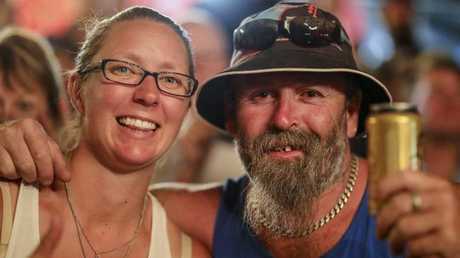 But as the punters who drive thousands of kilometres to reach the dusty track each year will tell you, it's the rule of 'whatever goes' that makes this outback race meet all the more popular each and every year. 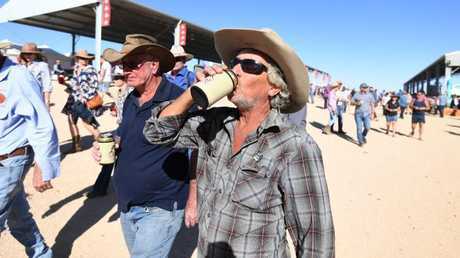 A racegoer drinks his beer at the Birdsville races. Picture: AAP Image/Dan Peled. 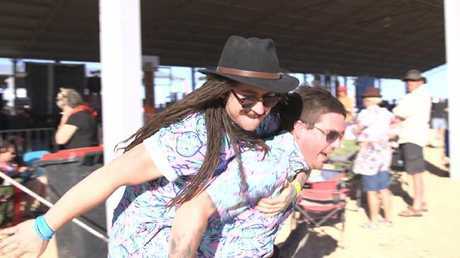 At the first day of the annual racing weekend - which is in its 136th year - the thoroughbreds thundered down the dusty racetrack as punters dressed in thongs and heels plodded through the turnstiles. Set on the edge of the Simpson Desert, and drawing more than 5000 racegoers from far and wide, the Birdsville races are the biggest event to hit the small town of around 100 locals each year. With golden cans in hand, it's hard to miss anyone not holding a tinny of Great Northern or a plastic cup of sun-warmed champagne. But while some come for the horses, the weekend is equally famous for its bizarre fashions and trackside frivolities. 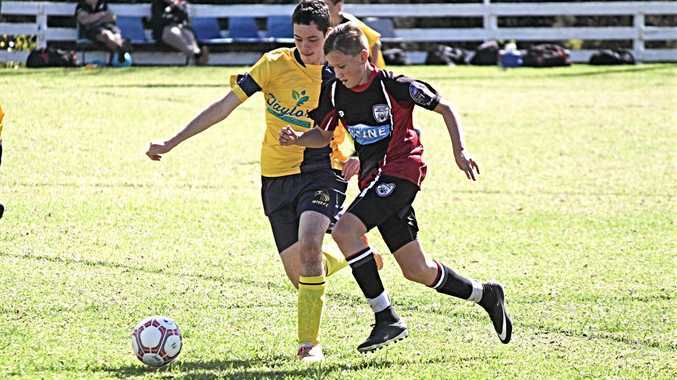 Dressed in Where's Wally costumes, horse heads and even a character from Shrek - the Fashions competition drew hundreds in to the spectator stands - each gawking at the ridiculousness on the field. 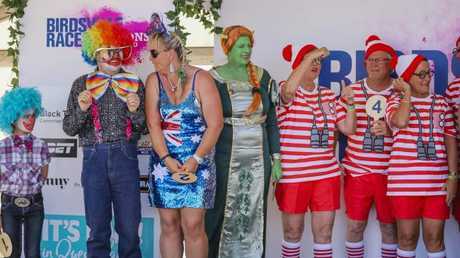 "I decided to come as Princess Fiona because my kids love the movie," the runner up in the novelty Fashions competition told news.com.au. "So Princess Fiona has been camping out. It took a lot of effort this morning to do the green paint and then to put the costume on as well as the wig and the ears. The green paint only goes up to the dress because I was not going to go up all that way. "I'm keen for a shower I just hope it all comes off." 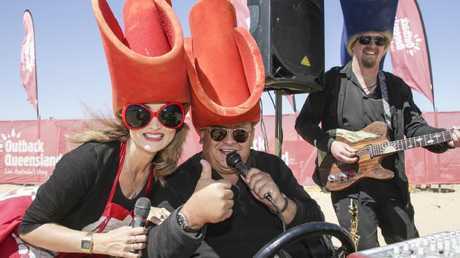 Debbie from Macleay in NSW, who spent two weeks making her way from Birdsville, decided to enter the fashions event dressed like Australia. With flags as fascinators and royal blue pumps, she said a spare pair of shoes was vital to see out the big race day. "I bought a pair of spare blowout shoes (to replace the heels)," she explained. "Why not." 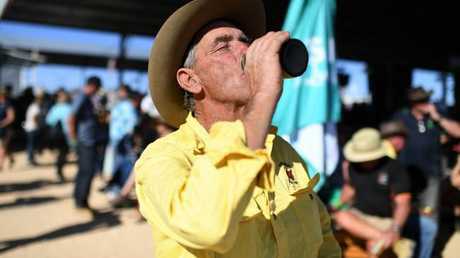 As the temperature crept into the mid-twenties, merchandise stalls reported selling more stubbie holders and singlets than anything else while cowboy hats, riding boots and thongs were the most popular attire. A male racegoer sports a dress at the Birdsville races on Friday, August 31. Picture: AAP Image/Dan Peled. "It's great to see everyone get involved," Jim, who had been coming to the races for three years said. "Makes for a good laugh." Western Queensland's richest race meet will continue on Saturday, bringing the total draw to 33 trainers, up from 19 in 2017, and 22 jockeys up from 15 in 2017. According to the North West Star, the field is dominated by Mount Isa with seven local trainers fielding horses across 13 races. 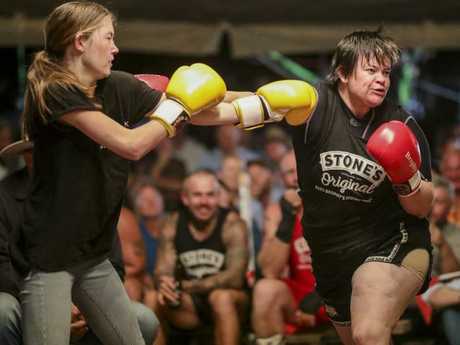 Female trainers have a strong presence at this year's event, with Rockhampton's Kim McGovern and Darwin's Tayarn Halter leading the women's charge. "It is testament to how this event continues to grow year-on-year," Mr Brook said. 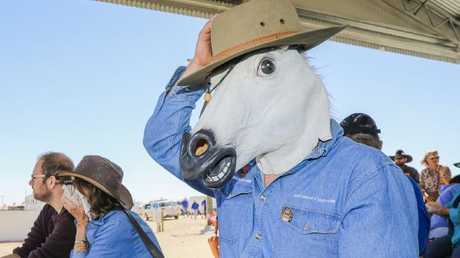 "The Birdsville Races have become not only a bucket list experiences for racegoers and travellers, but trainers and jockeys alike. "And with record-prize money on the line and new punting and broadcasting deals in place for the 2018 event, it comes as little surprise that the field has jumped up a notch." 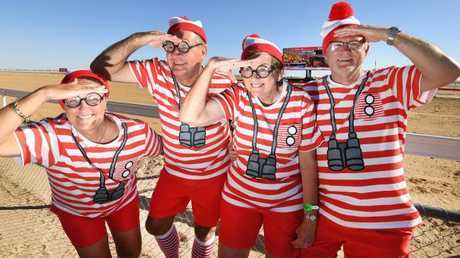 Julie Cover, Paul Cover, Miriam Twiname and John Twiname dress up as Where’s Wally for the novelty races competition. Picture: AAP Image/Dan Peled. Great Northern beer went down a treat trackside. Picture: AAP Image/Dan Peled. 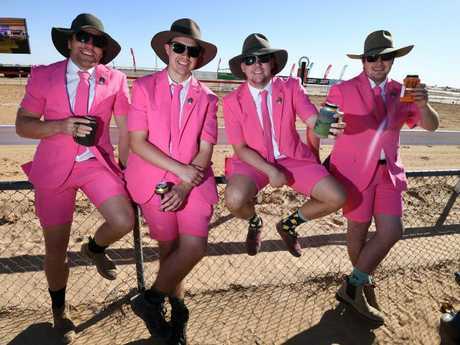 Racegoers in matching pink suits entered the novelty Fashions on the Field. Picture: AAP Image/Dan Peled. The Birdvsille Races brings around 7000 people to the tiny town of 100 each year.